Book Review- "Think, Act, Be like Jesus"
"Think, Act, Be like Jesus is a 90 day devotional geared at kids in the tween age unless you as the parent read through the devotional with younger children. The devotionals still have pictures, scripture, application, and prayer. 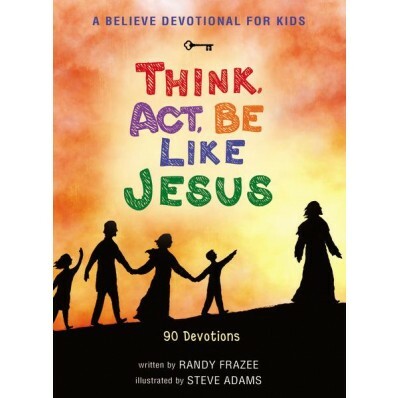 The book is broken into three categories- Think like Jesus, Act like Jesus, and Be like Jesus. Our goal should be growing closer to him and becoming like him. Think of it like you start to model and sound like the people you hang out with most so make sure you are hanging out and getting to know Jesus more so your actions become like his. I really liked this devotional and even though the front cover says, "for kids" I think big kids can appreciate this story or new believers. Zondervan sells this book or $12.99 so make sure to pick up your copy! I did review Randy Frazee's younger kids boko, "Believe" if you want to read my review.